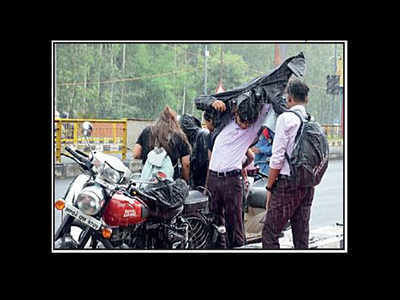 BHOPAL: Rains continued to lash the state capital for the second consecutive day, even as other parts of the state witnessed showers on Wednesday. From 8.30am to 5.30pm, Bhopal received 22mm of rainfall, bringing the day mercury down a few notches below the normal mark. On Wednesday, day temperature in Bhopal was 25.8 degrees Celsius, while at night it was 23.0 degrees Celsius. Meanwhile, winds in the city blew westwards at an average speed of 25km per hour. Officials of meteorological department here attributed the widespread showers in the state to a low pressure formation over central parts of south Uttar Pradesh and neighbouring districts. Rainfall is expected to dip in state in a day a two or till month end said the Met officials adding that another low pressure area developing over the north Bay of Bengal will lead to heavy rains in parts of the state. Another low pressure area developing over north of Bay of Bengal will lead to heavy rainfall in parts of the state, the met officials added. Boost your stamina & power with 100% herbs! Sale @61% offWah AyurvedaThe chemistry of cleaner & safer air is hereBASF For the state the weather office underlined possibility of heavy showers in Datia, Shivpuri, Ashok Nagar, Tikamgarh, Chhatarpur, Panna, Damoh, Satna, Umaria, Shahdol and Katni districts. In the forecast for Bhopal on Thursday, the met officials predicted cloudy sky with spells of showers. Day and night temperatures are expected to hover around 26 degrees Celsius and 23 degrees Celsius respectively, with the average wind speed of 20km per hour in the city. On Tuesday, day temperature in Bhopal was 25.9 degrees Celsius, four notches below the normal mark. The night temperature the same day was 23 degrees Celsius.